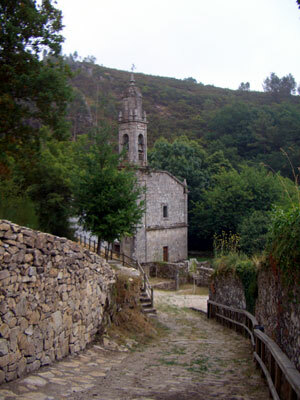 On a southerly and westerly route out of Santiago de Compostela on the AC543 and set in a small valley, is what was once reputed to be the wealthiest monastery in the whole of Galicia. Today this monastery fulfils a role as a Camino pilgrim hostel, but its economic and historic importance eclipsed that of many far larger religious communities and extended to political influence and control. The source of the monastery's wealth was tied to water in the form of fishing and a large paper mill and, as a result, the community of monks prospered for many years. At the time paper was a rare and valuable commodity and there were very few places from which to source it. Furthermore, the quality of paper being produced by this monastery was very high, adding to its already significant value. 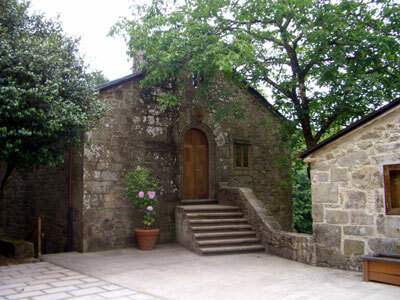 The monastery building is comparatively small and its internal features have been covered and disguised by the facilities and furnishing of its current use as a pilgrim hostel. As far as we could tell it was only open and staffed during certain times and it appeared closed during our visit. 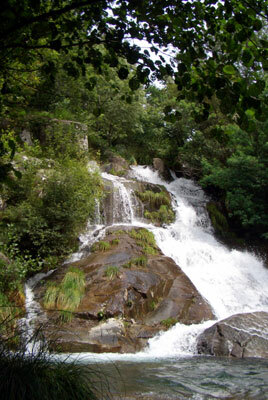 In keeping with many Camino stops there are picnic areas around the main building and these are enhanced by the presence of a narrow river and a small but stunning waterfall behind the monastery and an adjoining cemetery. To sum up, if you want to see monumental religious architecture you will be disappointed, but if you are passing through this area and make a casual stop, both buildings and waterfall should make the visit worth while. The path to the monastery is steep and there is a stair option if you prefer. You start off by walking down and finish with a short climb, but the walk is only a couple of hundred metres. Finally, a couple of photos of the waterfall which is both great to see in this day and age, but also critical to the sucess of the paper mill and the monastery in days gone by. 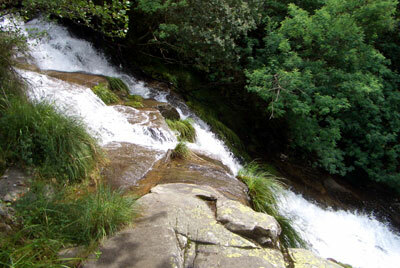 The waterfall is behind and below the buildings in the picture above. You get to it by navigating your way down a little path. How impressive the falls are is dependent upon recent rainfall. When we were there it had rained heavily a few days earlier, so we got to see it in full flow.